Over the course of a dryer’s lifetime, the various components which allow it to work will break down. Among the first to noticeably fail is usually the belt. This length of fabric is what connects the dryer’s motor to the drum, allowing the latter to rotate and keep your clothes in motion as they dry. It’s easy to tell when the belt needs to be replaced: it’ll start to emit a horrid squeaking sound during each cycle, as the various components attached to the belt fail to move freely. This is bad news for your dryer (and you). Thankfully this is something you can take care of yourself without too much difficulty. Let’s see how. Switch off and unplug the tumble dryer from the wall. Remove the two screws connecting the top of the dryer with the control panel. Remove the panel itself, leaving the wires intact. Take off the clips and screws keeping the top panel in place, and do the same with those connecting the front to the sides. You should now be looking at the interior of the dryer. Now you can see the belt, you’ll be able to check it for any damage and wear. If it’s too loose, it won’t be translating the spin of the motor to the drum, and will need to be replaced. If it looks like a replacement is in order, you’ll need to release the tension in the belt to remove it. Find the idler arm, which is usually just beneath the drum. Push it back and the belt will slacken, allowing it to be removed. While holding the belt in one hand, remove the drum with the other. This is where enlisting the help of a friend is hugely useful. Once everything is taken apart, try to manually spin the idler pulley with your fingers. It should spin smoothly and easily. If it doesn’t, it’ll need replacing; simply unhook it and swap in a new one. Your dryer’s drum rollers, found at the bottom of the drum towards the rear of the compartment, are another potential point of friction. Check them by manually rolling them around. If they don’t move freely, they’ll also need to be replaced. Wrap the belt around the drum again before replacing it into its original position. You’ll need to use the idler arm to get the belt tight again once the drum is installed. If you’ve done everything right, the belt should be able to move freely without any friction. 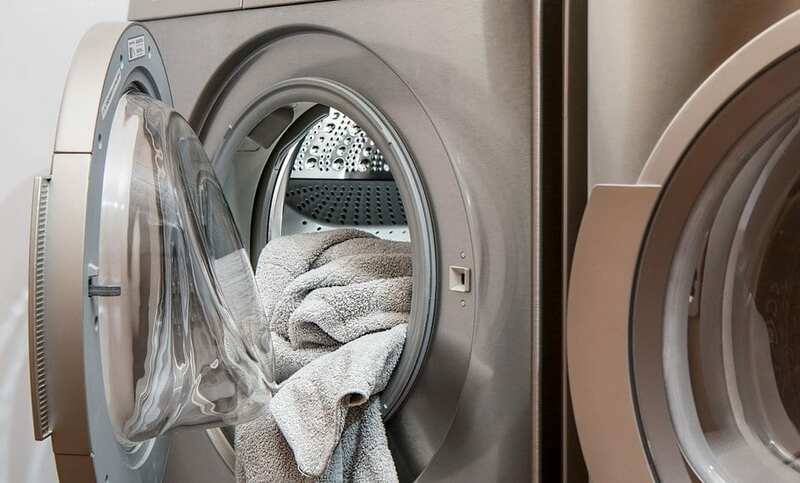 You’re almost done – you just need to replace the panels protecting the drum, and reconnect the dryer to the wall. The squeaking noise should have disappeared. Can You Stack a Washing Machine and Dryer? My Tumble Dryer’s Not Going Round! Why is My Tumble Dryer Blowing Cold Air? Previous Previous post: Gas or Electric Ovens?